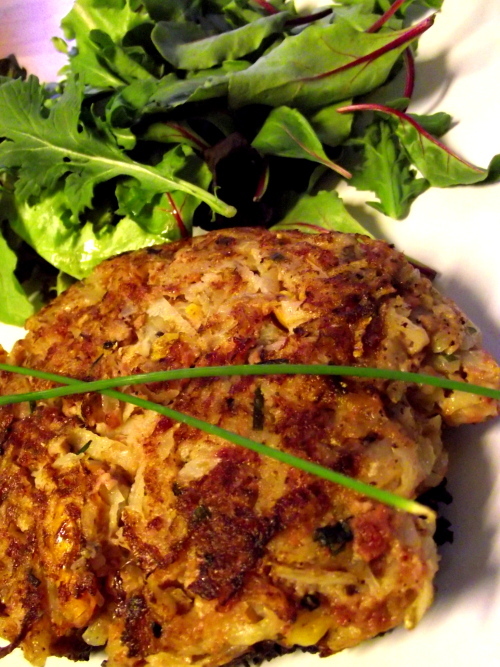 I like this as a dinner served with a simple green salad but hash cakes are obviously also fantastic for breakfast or brunch. Just top it with a poached or fried egg and a little toast and presto! You can also fry the hash loose rather than forming it into cakes which works really well if you’re serving a big group. A good alternative is to add a little grated cheese and I also like to add a little drop of ketchup on the side. Heat half of the oil in a large pan and add the onion, pepper, garlic & grated potato. Saute until everything is soft (about 10 minutes on medium heat). In a separate bowl combine all other ingredients and and mix well. Add the softened potato mixture and thoroughly combine all ingredients. Shape into patties (or leave loose) and fry in remaining oil on medium high heat (covered) for 7-8 minutes, flip and continue cooking hash cakes for another 5-7 minutes.